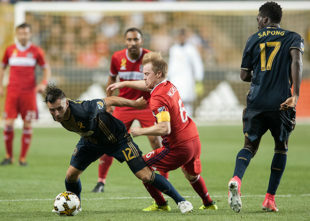 The Union come into Wednesday’s meeting with the Chicago with their first hint of momentum in the 2018 season. Two wins, followed by a draw that would have been a win but for a botched penalty, and the team has moved off the bottom of the MLS standings. Contrast that with a Chicago Fire that’s trending in the opposite direction, and this game becomes the Union’s best chance to get something going before taking June off for the World Cup. This has been a rough year for injuries in MLS, with the condensed schedule necessitated by the midsummer World Cup break testing the fitness and health of players all over the league. Chicago has been hit particularly hard, with six players certain to miss (three of them needing knee surgery) and a seventh questionable. With key pieces like Dax McCarty and Matt Polster not available, Fire head coach Veljko Paunović has had to make some interesting decisions with his game day roster. The prediction to the right is the lineup he used in their win against Orlando last weekend, and considering its success there’s every reason to assume he’ll use it again. And that lineup leaves clear opportunity for attacking teams. A three man back line requires disciplined defenders, and while Bastian Schweinsteiger’s credentials are beyond reproach, center back isn’t exactly his best position. That isn’t to say he’s a defensive liability, but should he drift forward the Union should look to exploit the exposed defense with their speedy attacking players. Injuries are effecting the attack as well, with de Leeuw, Collier, and possibly Solignac all missing the game. But the Fire still have Nemanja Nikolić, the Serbian Designated Player that has caused trouble for the Union before. They’ll have to be careful to contain the 2017 Golden Boot Winner, without neglecting Diego Campos or Aleksander Katai. With last weekend’s closely contested draw in New Jersey, and a challenging trip down to Georgia next weekend, now might be the time to try something new. Which is what the lineup on the right represents, something new. Fafà Picault moves into the front striker position, and David Accam gets the start against his former team. Supported by Dockal and Epps, Picault and Accam could use their serious speed to pick the injury-laden Fire back line apart. Also possible is a less radical option of replacing Sapong with Cory Burke. The young Jamaican impressed in his appearance against Montreal, and getting him game time against Chicago could be helpful if he’s needed against more challenging opposition later in the season. But this is Philadelphia. Traditionally head coach Jim Curtin doesn’t believe in squad rotation. He’s on the record saying that unless you’re a global super club you don’t have the depth to really make it work, and there is a certain logic to that. But it’s also logical to question that thinking when it allows cold streaks like the on C.J. Sapong is on right now, or putting the aging deep-midfield knees through 270 minutes of play in eight days. 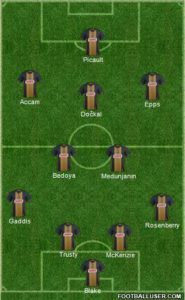 So while it would be interesting to see the Union try something against Chicago, it’s highly likely that we’ll see the same lineup as the last game. Auston Trusty and Mark McKenzie vs. Nemanja Nikolić. The Serbian has been too much for a lot of MLS defenses, but the Union center backs have been playing with skill and awareness surprising for their age. If they can contain the striker things look good for the Union, but that’s a big if. Fafà Picault. The Gazelle has had an up and down season so far, but he’s performed well the past few games. If he can get behind the Fire defense, or even just keep them busy while other Union attackers work, he could make key contributions to a Union win. The Union have shown they can put lesser teams to the sword by beating Montreal and embarrassing Real Salt Lake. And even if they should have come home with a win against New York, the draw against Red Bull shows they have what they need to keep up with the big boys. Against Chicago, especially a depleted Chicago at home, anything less than a win is unacceptable. “270 minutes of play in eight days” – this, in addition to a potentially 120-min-USOC match 3 days after Atlanta, and an MLS Toronto match 3 days after that. 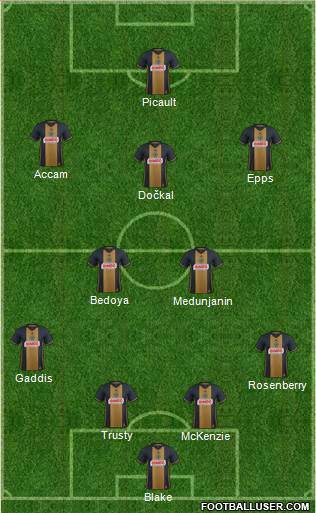 I imagine we’ll see some squad rotation with the USOC, but Curtin can’t sub the whole team out. I’m gonna say here what I said on another post: if you’re going to try something new, as suggested here, I think it makes more sense to try Accam up top. Picault has been fantastic on the L wing. Medunjanin and Dockal are now learning where to find him, he’s building chemistry with Gaddis, and it makes no sense to bump him out of that position. OTOH, Accam, who is obviously very talented, has struggled in that position and is building no chemistry at all. HE is the one to put somewhere new to see if you can get more out of him. If it isn’t working after 60 minutes you can put Cory Burke in. I’d rather start with Burke and bring Accam in at 60 if that’s the route you want to go. Burke deserves it more at this point. But I do agree with Accam going up top and leaving Fafa where he’s having success. Yup. I like the idea of Burke beating up the center mids for 60min, then hitting their tired legs with Accam’s speed – particularly grandpa Bastian. I think we’re all in agreement here that CJ needs a little break from the starting 11 though, right? I thought Adams was suspended for a red card at the end of the Orlando game. Did Chicago appeal?